I have heard of this trend edition hitting our shore ‘soon’ but it feels like I have been waiting forever. I finally got my hands on these polishes though so let’s have a look shall we. This collection consists of 4 polishes and 1 glitter topper. Blues of Being Cool is a light blue creme. It might lean a little to purple but for me, it’s definitely blue. Application was great and this two coats with no topcoat. I thought this might be similar or close to ‘Absolutely Blue’ but there is a difference when holding the bottles together. I really like this colour even though it might not be completely unique. The glitter topper is called “College Hero‘. Here it is over Blues of Being Cool. I have one coat of College Hero here. 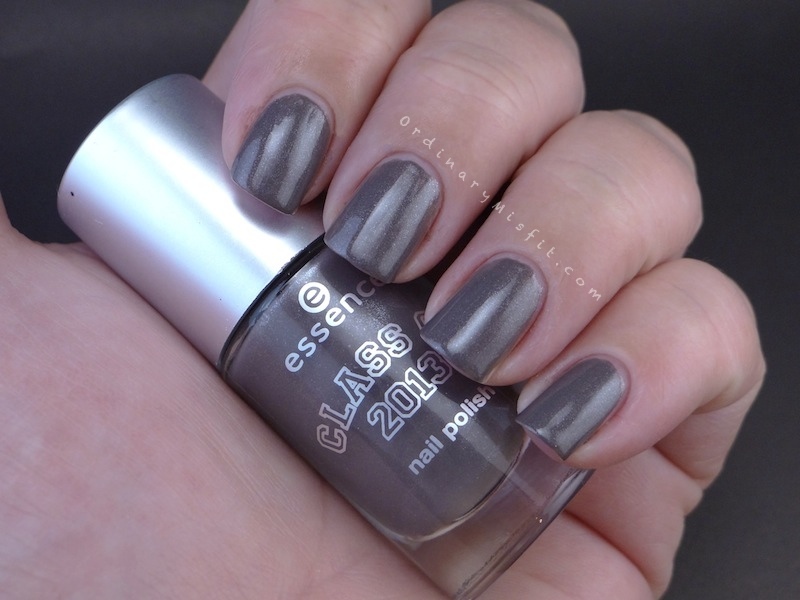 College Hero is silver glitter in varying sizes in a clear base. It’s actually very easy to spread and doesn’t clump together. This one coat I was painted on like normal polish. No placing of the glitter and no spreading either. It isn’t the most unique glitter I have seen but it is really easy to work with. School’s Out Forever is definitely my favourite out of the bunch. It is a brown / grey (taupe?) creme with a silver shimmer (micro glitter). I think it is my favourite because I don’t really have anything else like it. Application on this was great. It could almost be a one coater but I have two coats on with no topcoat in these pictures. Love this one. 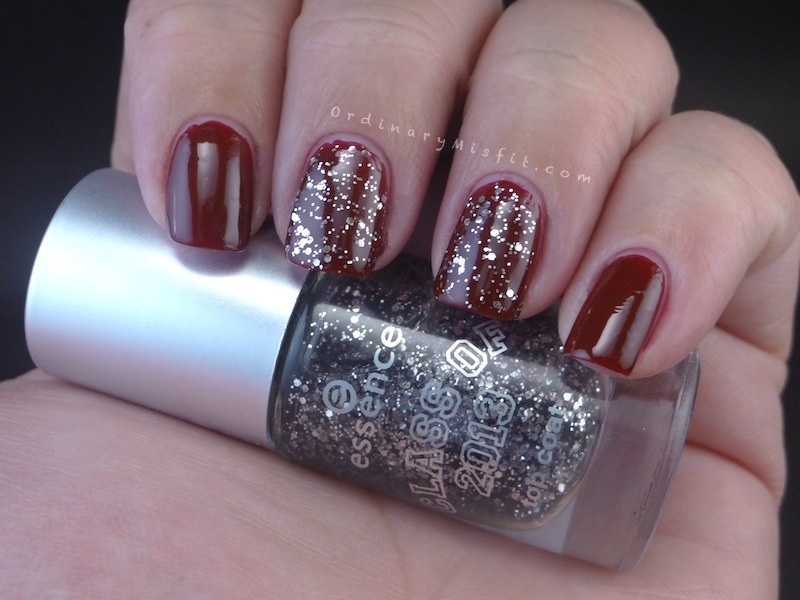 Here is College Hero glitter topper over School’s Out Forever. Once again, College Hero is great to work with. I don’t think the glitter does much for this shade of polish to be honest. 3 – Ready for Rush Week? Ready for Rush Week? is a deep red creme. I am wearing 2 coats with no topcoat. I really love this colour – especially for winter – but this one was the most difficult out of the bunch. Not unworkable, just not as easy as the other 3 polishes. The first coat is very sheer and sometimes streaky. It does even out really well on the second coat though. In some light I found the areas on the edges – close to cuticle and close to tip – to be a little lighter than the rest. It wasn’t extremely obvious though. Another thin coat of polish sorted that out completely. I thought at first that this was very similar to ‘Do You Speak Love?’ but when holding the bottles next to each other I could see there was a slight difference. Here I have one coat of College Hero over Ready for Rush Week?. I like the glitter over the red and once again, College Hero is a breeze. Alpha Better Gamma is a peachy pink colour. I really wish this leaned more toward pink. 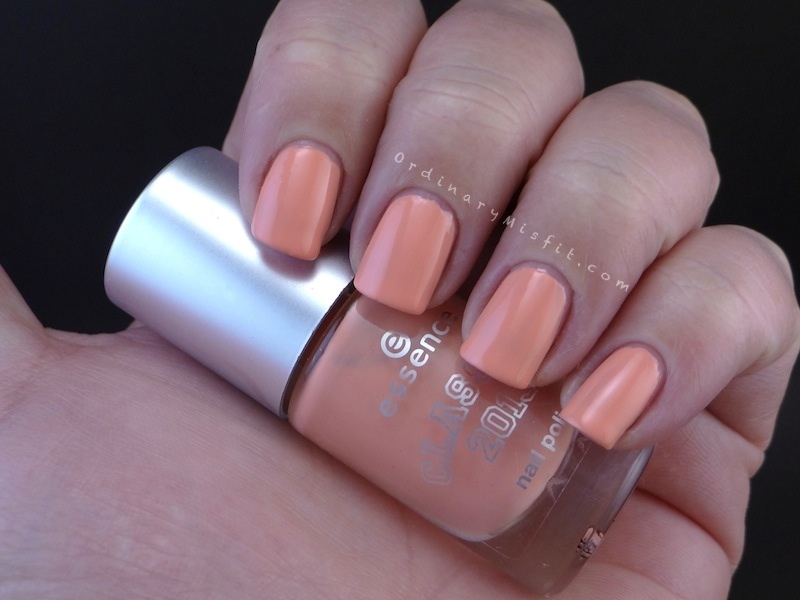 I have seen some people describe this as ‘coral pink’ and in the bottle it looks more pink than it does on my nails. I have on two coats with no topcoat. 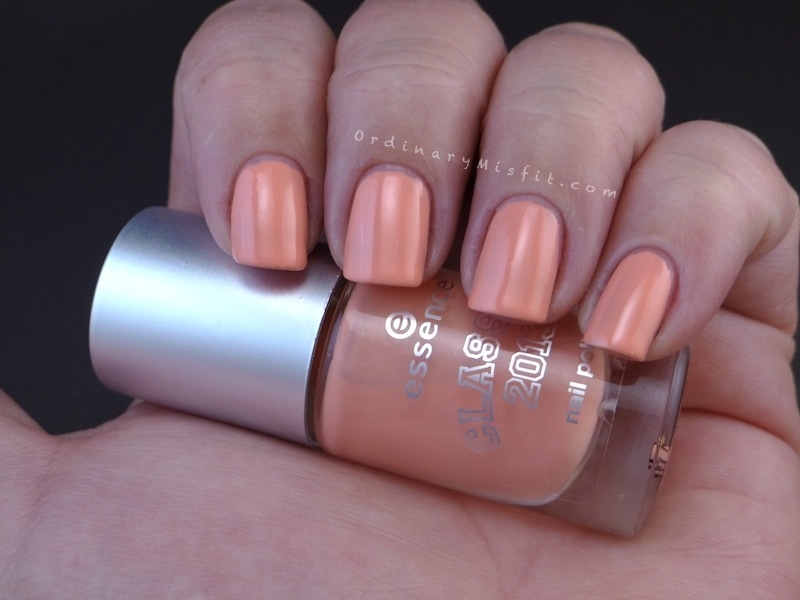 I am not a big fan of this shade but the application was good and I had no real issues with it. I just don’t think this shade suits me at all. I thought this was really similar to “Modern Romance”. This is one coat of College Hero over Alpha Better Gamma. 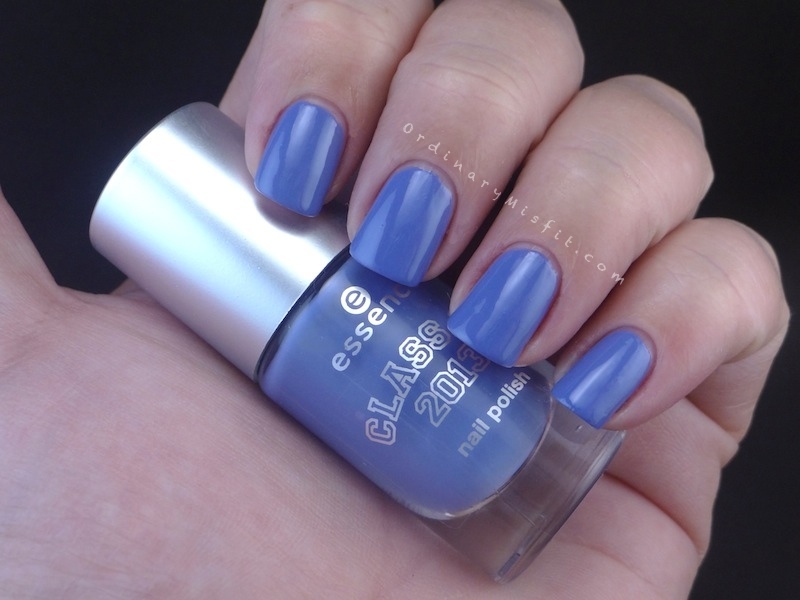 Do you think College Hero changes the colour of the polish on this one? 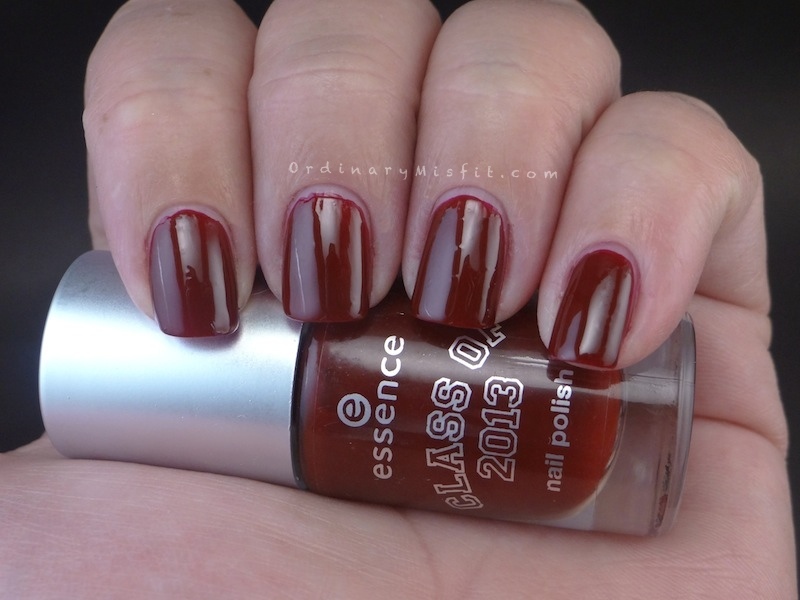 So that is the Class of 2013 limited edition polishes. In general I quite liked it even though some of the shades were quite similar to existing shades (some more so than others). I like the easy application of the glitter topper as well. My favourite shade is definitely School’s Out Forever. What do you think of these colours? Do you have a favourite? Do you want to see them – or some of them – compared to any other shades? Let me know what you think. Have a fabulous weekend everyone! It’s our wedding anniversary today so we will be doing silly things together. Do you have anything planned? Congrats on your wedding anniversary. May you two always be happy together. I’m dissapointed in this range, the promo photos looks better than on the nails. Was looking into getting Alpha better gamma but ja… Not if it looks more peachy. The glitter topper is gorgeous though. Yeah I agree. The colours aren’t really unique as they are very close to existing colour in the Colour & Go range (except School’s out forever) and they’re just a bit meh. Nice but not amazing. Alpha Better Gamma was the biggest disappointment for me. I thought it was much more pink than it was. I think it is a pretty colour too but it’s not my favourite. It’s also very similar to an existing Essence shade (so if you don’t get your hands on it you can always try Modern Romance 😉 ) It’s very pretty for spring! ALPHA BETTA GAMMA! LOVE LOVE LOVE! On you I love School’s out Forever because it is different and I like how it looks on you. The blue also looks awesome on you! I like Alpha Better Gamma and I like the topcoat over it, too. Although, “School’s Out Forever” wins for the names, hahaha. Hah, I love the name as well!!! I did have a lovely anniversary thanks so much!